Steve Kerr would not discuss the possibility of LeBron James joining the Golden State Warriors. Kerr only joked that he would have to write a check after being fined for tampering. The comment came after a report said James would consider meeting with the Warriors in free agency if they had max cap space. 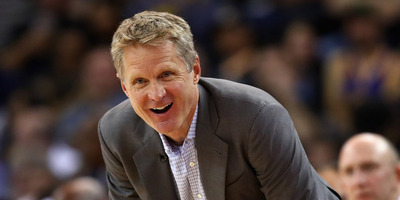 Golden State Warriors head coach Steve Kerr passed on wading into the conversation following an ESPN report that said LeBron James would consider the Warriors in free agency. On Thursday, when asked if he would like to coach James, Kerr simply asked reporters to whom he should write his check. Kerr would be fined for tampering if he spoke publicly about James’ impending free agency. The report on Thursday said that James would be open to meeting with the Warriors if they could open up max cap space to sign him. That would come with complications for the Warriors, who currently have an estimated $US128 million in payroll for next season and would have to break up their dominant core to fit James. Additionally, the report said that the Warriors at this time aren’t considering moves to make room for James. Kevin Durant also had a short reply to the report.